Jacks Monterey has an intriguing four-course prix fixe dinner menu available for Valentine’s Day 2018, and they are still accepting reservations (call 831-649-7874). Dinner is $64.95 per person, exclusive of tax and gratuity. In addition to the meal below, diners receive a box of chocolate-covered strawberries to go! I had the opportunity to dine at Jacks a couple months ago, and the food from executive chef Danny Abbruzzese was exquisite. 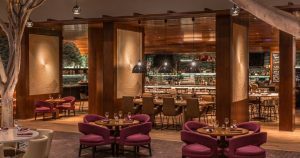 The restaurant is located inside the Portola Hotel & Spa at Two Portola Plaza. For more details, visit portolahotel.com/jacks-monterey.com.